As a bridesmaid, you are part of the bride’s mini-army. While you were chosen because you hold a special place is the bride’s heart, you also have a duty to make sure as little goes wrong as possible. This is an unspoken agreement, but if you want to be the best bridesmaid possible, you will need to come to the wedding alert and ready to jump into action. These duties include more than just fixing the train of the bride’s dress, or making sure Uncle Gary doesn’t drink too much. 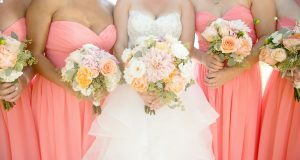 Even if you are not the maid of honor, you still have the ability to make the wedding better, help the bride stay positive, and make sure everything goes smoothly. The one important thing you need to remember about being the best bridesmaid is that this is not your day. Some bridesmaid can get a bit competitive with each other to prove to the bride that they are the better friend or sister, or you may even have a feud with one of the other bridesmaids. But on the wedding day, if you do anything, make sure it is to not cause more drama for the bride. Remember that this is her day, so do everything you can to make it better. In this blog, we are going to give you tips on being the best bridesmaid and how to prepare to make the wedding day better than expected! If you have been chosen as a bridesmaid, read on and study up! This may seem like an obvious thing to do on the wedding day, but forgetting ANYTHING can make the entire day more stressful for the bride. You could delay the entire ceremony if you forget your shoes, dress, or even your makeup. Make a checklist of everything you will need, even the things you never forget like your cell phone and purse. Pack all your stuff in a single bag before you head to the venue to make sure that you don’t accidentally forget any of the items you need. If you know that the bride’s sister or other bridesmaid is generally forgetful, be sure to send them a message with a list of everything they need to grab. This seems like a small tip, but it is extremely significant. Really, we could keep adding to the list, but you can only bring so many things! If you decide to carry around a clutch or bring your purse to the reception, be sure to have these items in there so that they are easily accessible. You never know who is going to need what throughout the wedding. While you want to be in the moment and not be on your phone the entire time, there are special moments that the photographer may not see that you can capture. Especially while getting ready, there are many behind-the-scenes moments that you can capture and the bride will love. This does not mean you should be on the phone during the wedding, but if you see a photo opportunity, don’t hesitate. Dancing at a wedding is one of the best parts of a wedding. Most guests love dancing but are not brave enough to be the first on the dance floor. As a bridesmaid, it is your job to help get the party started. Bring your dancing shoes, both figuratively and physically, to help get people on the dance floor. Unless you wear heels for a living, you will want to bring a pair of comfortable shoes that you can boogie in, hit the dance floor with the other bridesmaid and dance like no one is watching! People will feel more willing to come dance when they see other people dancing their hearts out. It might be a good idea to practice your dance moves beforehand to ensure that you don’t become the entertainment. The bride is going to be running around trying to make sure everything sticks to the schedule and that she greets everyone to celebrate with her. It is your job to help her in any way you can. This could include everything from fixing her dress regularly to hunting down her family members that need to be in the photographs. Check in regularly to make sure there isn’t anything she needs, but don’t be obnoxious or overwhelming about it. You want to help, not stress her out even more. If you notice guests getting a little too rowdy, give them some water, food, and help them settle down a bit. Helping taking care of issues before they stress the bride out is a great way to keep the wedding fun and the bride happy. 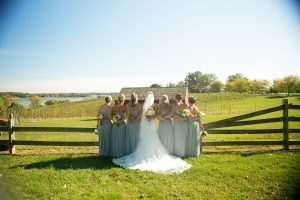 While helping the bride plan the wedding is generally left to the maid of honor, you can throw in some helpful suggestions, like having the wedding at Bohemia River Overlook. Our unique venue offers three different locations that are sure to fit the needs of the bride and the style of the wedding. Giving the bride this suggestion may be one of the best things you can do for the wedding! Check out our locations and spread the word about our beautiful venue. There are many ways to be the best bridesmaid and help make your friend’s wedding better than they could have expected. These are only a few of the many tips to perfect your duties as a bridesmaid. Be sure to keep these in mind as the wedding draws closer and if it is still in the planning process, tell the bride about Bohemia River Overlook! Contact us to learn more.